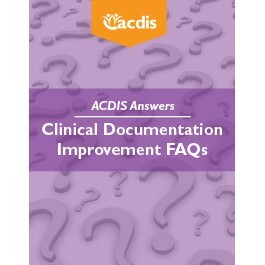 ACDIS Answers: Clinical Documentation Improvement FAQs is a quick reference guide for the most common questions faced by CDI specialists. Organized by Major Diagnostic Categories and broken down into specific topics of concern, ACDIS Answers provides information not only on documentation needs but also on issues related to the CDI profession. This compendium of commonly asked CDI questions is an essential reference book and office companion, valuable for new CDI specialists as well as those experienced in concurrent medical record review. Whether you’re wondering about sequencing guidelines, staff productivity, escalation policies, diabetes coding, or documentation requirements for acute kidney injury, ACDIS Answers provides quick, easily understandable information from respected experts in CDI, including ACDIS’ own Boot Camp instructors and Advisory Board members.